‘LoopKlängeNoise’ brings together the skills of Arnaldo Pontis, a Sardinian industrial and experimental musician working as the Magnetica Ars Lab project, and that of the legendary Maurizio Bianchi from Milan, whose best known work remains a pivotal influence on much noise, power electronics and dark ambient that has come since the early 1980’s and onwards. Via the contribution of MAL, ‘LoopKlängeNoise’ is a highly conceptual piece with regards to tonality, visuals and the ideas that came to influence it in the first place. A great sum of inspiration, as indicated within the booklet is accredited to the work of the Russian-born Expressionist artist Wassily Kandinsky. ‘LoopKlängeNoise’ also features the contributions of various musicians from the Sardinian and Italian industrial scene, each contribution covering the thirteen tracks that make up the album. The assisting artwork, coming within a DVD sized case, shows us a series of black and white photographs that are shot amidst bleak, dystopian, modernist or dilapidated architecture. With each of these images are quotations from various figures, which include the likes of Futurist and noise music pioneer Luigi Rossolo, the innovative French modernist composer Edgar Varése, American avant-garde pianist John Cage, and Teutonic trance master Klaus Schulze. Literary references also include the transgressive fiction writers William S. Burroughs and J.G. Ballard. Many of the texts herein pertain to the realm of music and noise, the greater areas of sensual perception, and how they interrelate as a greater whole to cultivate works of art. It is here when the medium of images and words are forged together with an aural outlet, that the concepts that have been put forward make perfect sense, helping to give more sense and fulfillment to a meticulously crafted palette of sound. The material of this album works mainly within in the area of quite ominous drone and electro-acoustic timbres, which throughout different pieces are accentuated with sequenced synthesisers and pads that help to add different shades to each composition. Thankfully, the plethora of guest contributors does not deviate nor make for an incohesive listen. 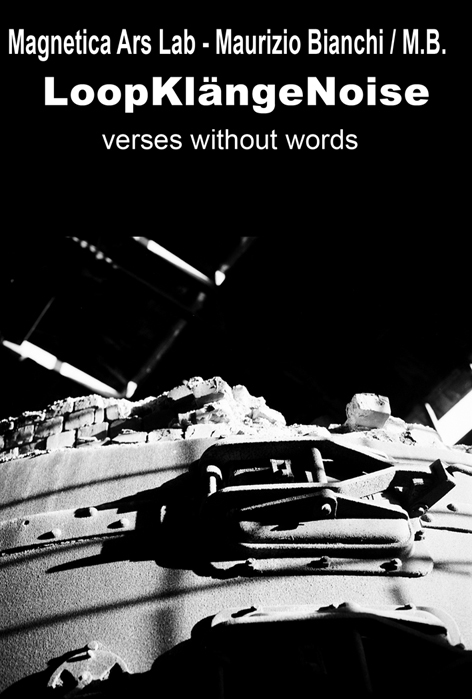 The use of samples, field recordings, radio broadcasts, female vocals and occasional guitar helps in separating and breaking down ‘LoopKlängeNoise’ into a series of aural vignettes that make this album a relatively pleasing, well-crafted and contemplative journey through concepts that are firmly embedded into the spirit and philosophy of industrial music.